Wellhouse Leisure is a market leader in everyday, compact campervans, and is also an approved supplier of Reimo parts and accessories for campervan conversions. It was established in 2003 and now produces over 200 vehicles a year from its premises (including a factory, bodyshop and showroom) near Huddersfield, Yorkshire. 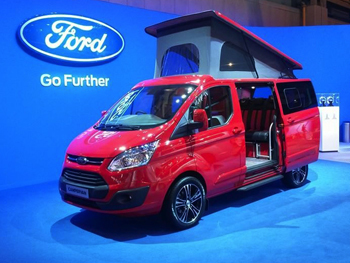 Our first Wellhouse assignment was to launch its new Ford Terrier campervan – the first UK campervan conversion based on the new Ford Transit Custom. 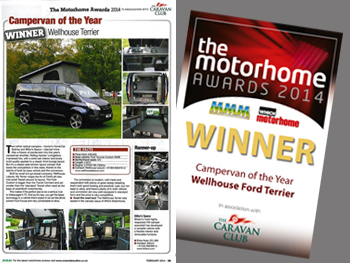 Just weeks after its launch the Wellhouse Ford Terrier was voted The Campervan of the Year 2014. 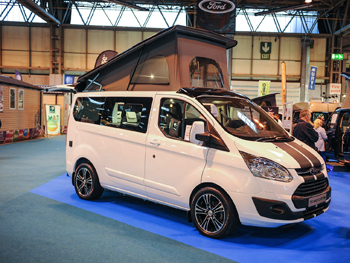 We invited media to its official launch, prepared a press pack and achieved coverage across the specialist leisure and national media, such as this review by the motoring correspondent in The Guardian, HonestJohn.co.uk and Practical Motorhome. Working with Wellhouse Leisure on an ongoing basis has enabled us to keep the media supplied with a constant supply of news stories as well as regular social media activity. 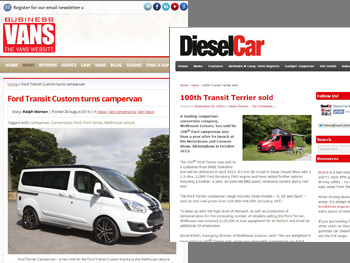 We’ve also announced its other new models, like the Mercedes Moselle campervan and Ford Evie camping-car.